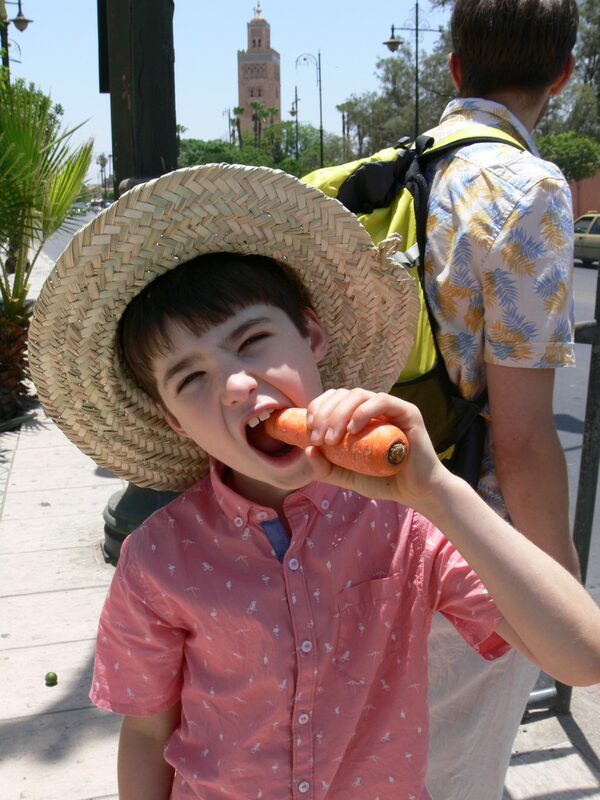 Episode 2… it’s all about the food. Not surprising for a family that marches on its stomachs. Besides the fact that June is pretty hot in Marrakech (between 34-44 degrees C when we were there), it was also the middle of Ramadan. This means that almost everyone is fasting for daylight hours. I had googled and read extensively about this beforehand, as is my wont, and had briefed the husband and the kids on what I had found out. They got a bit of a worst case scenario, but in the end I was glad of this, as it became part of our cultural awareness. (I know this sounds wanky, but its true). 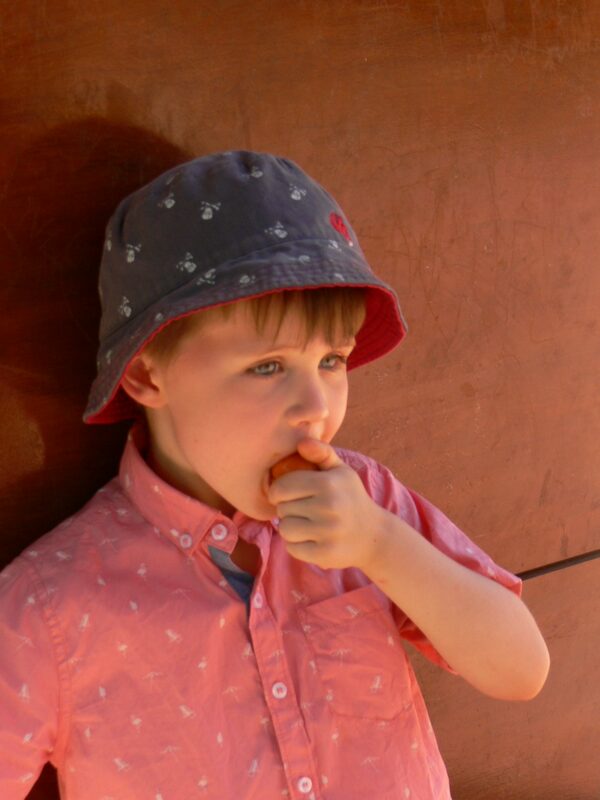 The kids (and the grown ups) were much more aware of what was going on around us. I was thrilled that the boys were genuinely excited when the final call to prayer of the day came because they knew it meant that the people all around were breaking fast. They were really interested in the food that people were eating, small clusters of taxi drivers and street vendors gathered together sharing harira and bread, made it all the more special to be there at that time and we felt privileged. The reality is that you can eat and drink (though be warned! if you are after a boozy holiday, this is not the place for you) during Ramadan in the streets and in cafes and restaurants in Marrakech, and also when you are out on tours, but the more rural it gets, the trickier it gets. 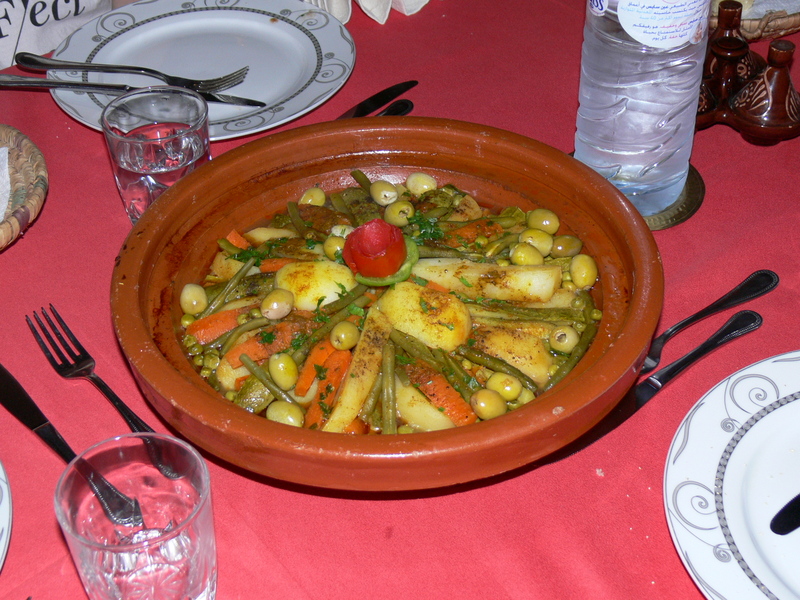 Our first tour was into the Atlas mountains and included in the tour price was a traditional Morroccan lunch. It took the driver several calls to find somewhere for us to eat and the village that we ended up in had about 6 other restaurants, all of which were closed. The meal was delicious, a traditional tagine, tinged with a touch of guilt for the people who had made it and were sitting dozing in the sweltering shade waiting for another 7 hours for their meal to come. We mostly ate in a couple of cafes round the corner from our Riad, it was simple stuff, western mixed with Morroccan. The first day, we sat down, ordered and then watched with slight confusion as the owner/chef hopped on his moped and sped off. Thankfully, he returned 10 minutes later with several bags of ingredients and then proceeded to make our dinner. Definitely no issues about the freshness of that meal! 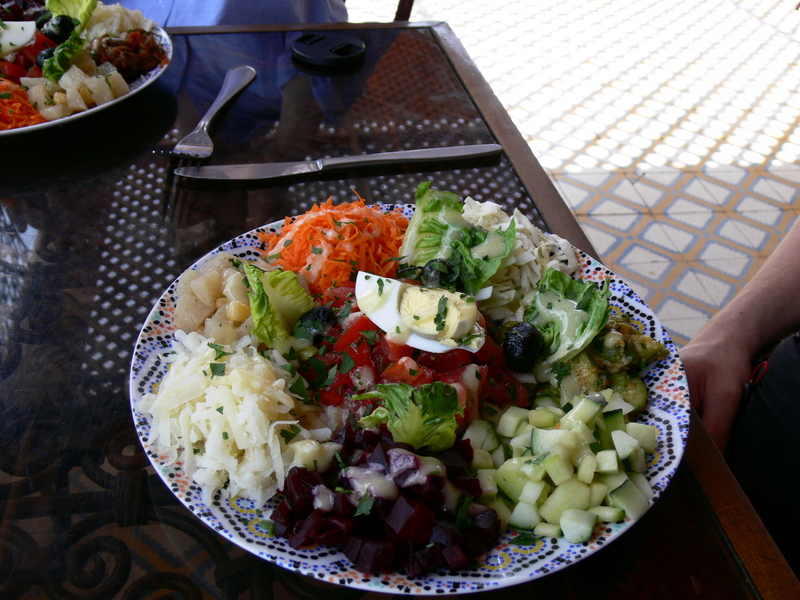 I recommend a Moroccan salad, a bit of everything to freshen your palate and cool you down. We were eating around 5-6pm most nights, but the couple of nights we did eat later it was definitely noticeable that everyone around was getting more tired and grumpy. We tried to encourage the kids to be as considerate as they could by not yelling loudly about how long their dinner was going to be… etc, this worked sometimes, but when you have a starving, grumpy 5 year old, this is easier said than done and we got a little stressed. One night, sitting on a roof terrace about an hour (stuffing our faces with chips) before the fast was due to break, we saw one stall holder rip off his shirt and fly across to launch himself at another stallholder and then the next night we saw a horse-drawn carriage driver leap off his seat, waving his whip furiously and chase another man down the road), his passengers sat looking dumbstruck as this all went on around them. These breaches of the peace seemed to be largely dealt with by about 100 Moroccan men swarming the scene within seconds. On the latter occasion, the police did actually turn up, though they happened to be driving by, but it was impossible to see what they’d actually be able to do to make any difference. The tastiest meals we had in Marrakech were in Café des Epices and The Earth Café (60-70dh), but the street side tagines, pizzas and burgers also hit the spot and were hot and tasty (25-35 dh). Plus you get to see the crazy Moroccan streets whizz by you, which is brilliant entertainment in itself (see main pic). We were not brave enough to eat from the steaming piles of food in the Place de Jemaa el fna, but enjoyed the hilarious banter from the salesmen as they descended upon us trying to persuade us that theirs was the place to frequent. As soon as they caught a whiff of an English accent we were subjected to all sorts of random phrases ‘lovely jubbly’; ‘cheap as chips’; ‘alright guv’nor’ and other things not heard since Delboy and the 80s. Top tip: If you can, buy bread and fruit from the market stall holders – we found the road leading out of the city down to the bus station to be our best place for that – Rue El Gzah. I have no doubt that I was charged at least 3 times more than the locals for several carrots one day as a conversation definitely went on between the lady serving and the chap sat in the back, about how much I should pay, but as it was still only 5dh, I let it go… (!) You can also stock up on a wide selection of dried fruit and nuts from the Stalls in the Place de Jemaa el fna. It is great to take this food and sit in one of the city’s parks and enjoy the shade and relax a bit out of the heat. The other side of Marrakech: Our night porter, Yusuf, had a regular takeaway delivery every evening at around 11pm. He explained that was this was because when you break the fast it is with a light meal and then there are more meals during the night before getting a few hours sleep. Tough stuff being in the tourist industry at that time of the year, I guess, not much rest day or night. He recommended that we go out late at night and see for ourselves what happens to Marrakech after the tourists go to bed, so at about 1am on the last day, my friend and I wandered down to the main square and as the last dregs of tourists were piling out and the souks and stallholders were all shutting down we wondered what we would find… We inevitably got lost, but entered into a sort of parallel universe. Shops and stalls that had not been open during the day were now in full flow with whole families out for a stroll, a haggle and an evening meal. It really reminded me that in cities like Marrakech there are most definitely 2 sides and I went away feeling really pleased to have seen them both, even if one was only for an hour. So, in short, don’t be afraid to do Marrakech during Ramadan, if anything we found that it enhanced our holiday. I love any mention of food! Another family of stomach marchers here! 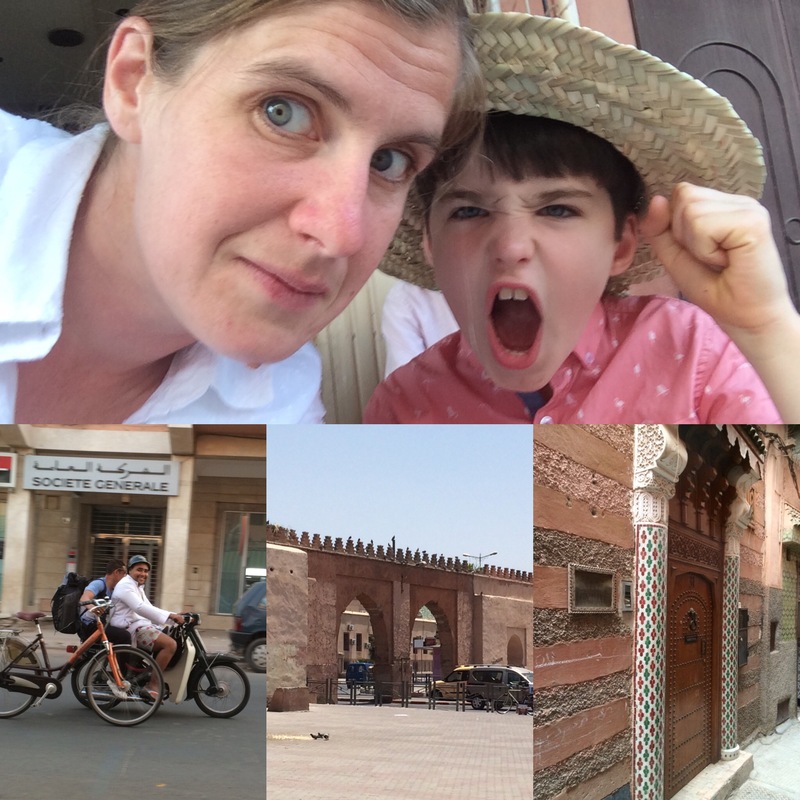 Always wanted to go to Marrakech but not sure I would have thought of going with the kids….sounds great! Well at least they go for the quality stuff! We’re thinking that when we go back we’ll do a few days in the city and then a few days on the beach in Essaouira. Always holiday planning here! Moroccans are remarkably relaxed about serving tourists food and drink during the day, but you’d have to be extraordinarily insensitive to enjoy eating in front of a dehydrated waiter. Breakfast is a relatively easy meal to serve as thirst hasn’t really set in. My advice would be to eat a really good breakfast, then skip lunch.